Heat the olive oil in a large soup pot. Add the cauliflower and garlic. Sauté for a minute or two, until the garlic is fragrant. Add the milk and 2 cups broth. Simmer for 10 minutes or until soft. Add the while beans and mash roughly with the back of a large wooden spoon or a potato masher. Stir in the cornmeal (the mixture will start to thicken). Adjust the consistency by adding the last cup of broth to the consistency you want. Stir in the cheese and season to taste. Heat the extra virgin olive oil in a nonstick skillet over medium low heat. Add the greens and garlic and sauté until softened. If using kalettes, add a little water at the end to sort of steam them to finish them off. Remove kale and wipe out pan with a paper towel. Using the same skillet as you used for the kale heat it over medium heat. In a small bowl mix the extra virgin olive oil, garlic powder, onion powder, paprika, salt and pepper together. Place shrimp into a medium bowl and pour oil and spice mixture over shrimp mixing to coat shrimp. 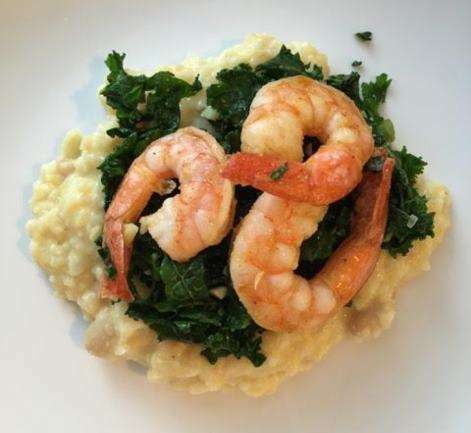 Serve the shrimp and kale over the cauliflower mash!